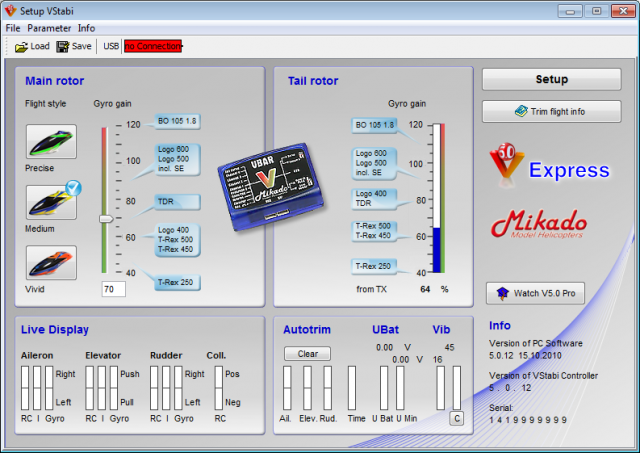 The VBar software has two modes: The flight menu and the Programming Assistant (Setup Wizard). The Programming Assistant (Setup Wizard) leads you to a finished setup in 11 consecutive steps. You must read and follow the short explanations supplied at each step. In several places you have the option of clicking on buttons showing a little book with a question mark. These buttons lead you to the www.vstabi.info website where you will find additional relevant information. Also, by hovering the cursor over a button, you can find additional online information. You can move around in the setup menu by clicking “Continue” and “Back.” You cannot click on the individual tabs.